São Paulo Bike Parking: Mauá and More! São Paulo makes it convenient for people to park their bikes and transfer to rail. Photo via ASCOBIKE. In 2001 Adilson Alcantara, manager of the Mauá CPTM (Companhia Paulista de Trens Metropolitanos) train station in the greater São Paulo region was faced with a challenge: What to do with the hundreds of bicycles precariously and haphazardly chained to every open space of the Mauá train station? At the time, the cycles obstructed the walking lanes for both pedestrians and passengers. 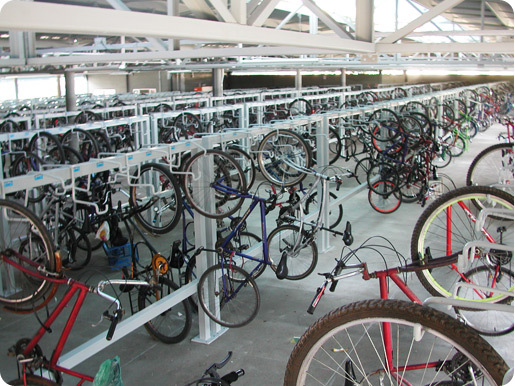 The solution: Alcantara developed Latin America’s largest bicycle parking station, which provides parking for nearly 2,000 users daily, repairs and maintenance centers, in addition to social services, such as legal counsel. The Mauá bicycle station in collaboration with ASCOBIKE (Associação dos Condutores de Bicicletas de Mauá), a bicycle riders association, initially began with 200 users but has grown to nearly 2,000 users daily. Around 70 percent of ASCOBIKE users transfer to the CPTM train, a commuter rail serving São Paulo city that connects to the São Paulo metro system. The program has been so successful that it has been replicated across both the CPTM and São Paulo Metro, which collectively now boast more than 44 biciletários (bike stations) with more than 10,600 spaces for bike parking. In addition to the bike stations, São Paulo began a public bike-sharing program in 2009, which at the inauguration date, offered 150 bikes across 15 central metro stations. Members of the Mauá station pay a monthly fee of R$10.00 (approximately US$5.00) while non-members pay a R$1.00 daily fee (approximately US$0.50) while. Members receive benefits, such as discounts on repairs and bicycle parts, however, all users may access showers and restrooms, 24-hour bike parking, preferred spots for women and the elderly, tire pumps, bicycle loans during repairs, health insurance plans, social workers, legal services, cold water and, of course, hot coffee (this is Brazil, after all!) Other bike stations within the system of CPTM and Metro provide free service, only requiring that users register their bikes, which affords management with valuable ridership statistics. 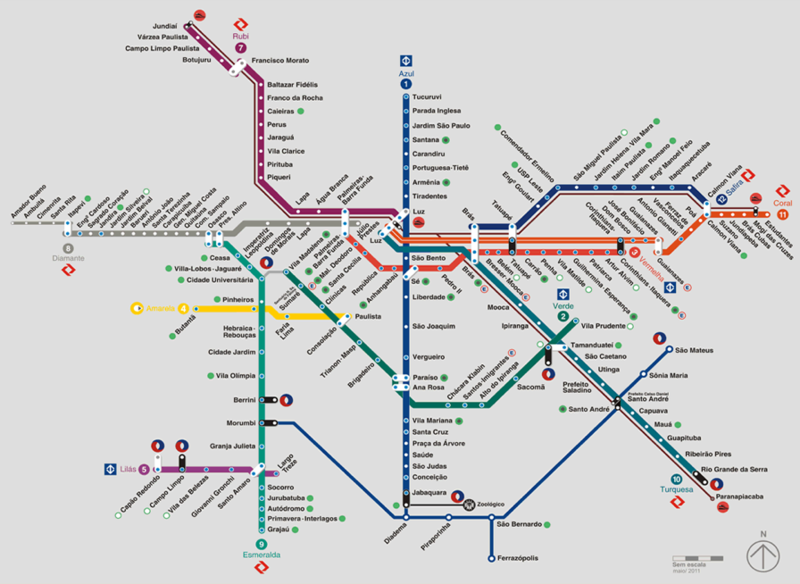 On São Paulo's metro map, the green dots represent bike stations, and green dots with a black circle represent bike sharing stations. Map via CPTM. Amazingly, the success of the Mauá station has happened with nearly no bicycle lanes or infrastructure, and little legal legislation in the way of protecting riders. While Mauá is expected to install exclusive bike lanes along Avenida Washington Luís in the upcoming weeks and the Rio Pinherio commuter trail is currently in Phase I, offering more than 14 kilometers, São Paulo lags behind other Latin American cities, such as Bogotá or Mexico City, in terms of bicycle infrastructure. Law 201 states that motorists must maintain a distance of 1.5 meters from a bicyclist, however this is difficult to enforce and, as a result, not a single motorist has been fined for this infraction in the past two years, according to the Diario do Grande ABC, a newspaper that covers the greater São Paulo region. According to Alcantara, the Mauá station and ASCOBIKE not only take care of bicycles but the people riding those bikes. The bike and train integration has served as an example of sustainable transportation in terms of cost to both the user and to the environment throughout the São Paulo region. As non-motorized initiatives continue to grow throughout Brazil in cities like Rio de Janiero, Recife and Belo Horizonte, hopefully other Latin America cities will take notice and replicate the achievements of South America’s powerhouse. 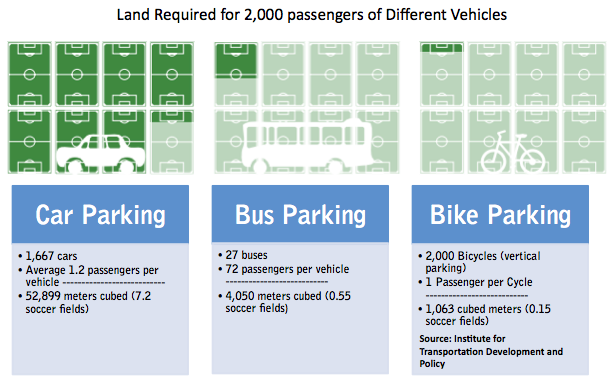 ITDP, which helped to develop the bike parking station, shows the amount of land required for cars, buses and biking in its bicycle parking facility manual. Chart via ITDP.